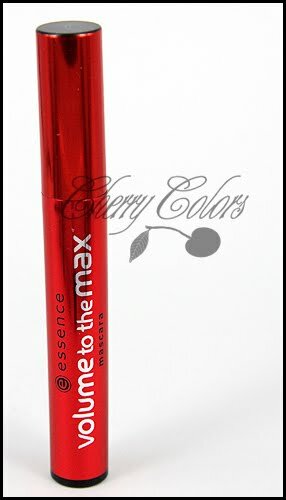 Review: Essence Volume to the Max - Cherry Colors - Cosmetics Heaven! Today my review is about a cheap mascara from Essence. I really like most of the stuff from this company, not just because they are affordable, but also because the quality of most of the products are good! The package is interesting, pretty classy (I love the red color of it!) and shiny. It doesn't remind me of a cheap mascara. The mascara has an interesting brush. I didn't expect it when I bought it! It's shaped as a regular (well double) comb. I feel that it's really easy to apply it because of the comb shape. It lengthens the lashes nicely, adds SOME volume (not too much) and it separates the lashes nicely. So it doesn't clump! Let's start with my bare lashes. They aren't thick, have a slight curve to them and I could call them mediocre. Nothing special. I applied one coat and then took some pictures. I didn't realize that I messed up my eyes, I mean that I bumped with the brush on my lids, ouch! Then I applied a second coat because most of the time I put on two coats. +If you put on 2+ coats you get lashes that look like fakes! +Is not tested on animals! Overall: I really like this mascara even if I wasn't such a big fan some time ago. The brush is a genius, so hopefully my next mascara will have a similar brush! Sadly this mascara was discontinued but it was really affordable! Mine didn't dry even after 3 months of regular use (when my Estee Lauder .. blah totally another story!). The bad part of it is, that when it comes in contact with water/sweat/tears it will melt off. Not completely, but just on the part where it came in contact with the liquid. I wish it would come in a waterproof version and maybe that it could give me some more volume. But after all, it's perfect for an everyday look ;)! After all, I'm pretty satisfied with it!